The American Institute in Cairo offers financial aid to graduate students with financial need. 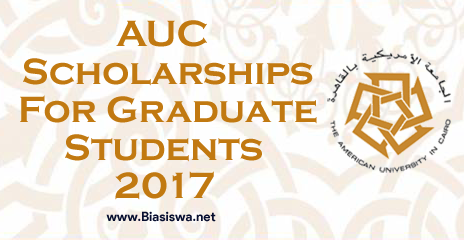 The applicants for AUC Scholarships For Graduate Students, 2017 should be degree-seeking candidates. The candidates should have submitted their application for admission at the American Institute in Cairo and received an AUC ID number. The applicants should have a financial need. The candidates should not be on probation i.e. the candidates should not have CGPA less than 3. The candidates applying for AUC Scholarships For Graduate Students, 2017 should submit an official statement of the students' or their spouse's net annual salary (original copy may be required upon request). The applicants should also submit most recent business or clinic net annual income statement from CPA, real estate rental contract, and El Heyaza El Zeraia proof. The candidates applying for AUC Scholarships For Graduate Students, 2017 should also submit loans or installment statements, enrollment of with annual tuition for children or spouse at school or university, home rental contract, medical reports, medical insurance premium, death, and divorce certificate, and proves of student loans, unpaid leave, and job contract termination.